A first edition copy of The Little House, the 1943 Caldecott Medal winning book, is coming up for auction on July 12, 2007 at PBA Galleries. 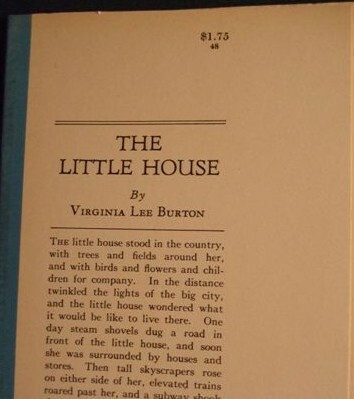 The first edition The Little House is very difficult to find, and some have estimated the book will sell for close to $10,000. 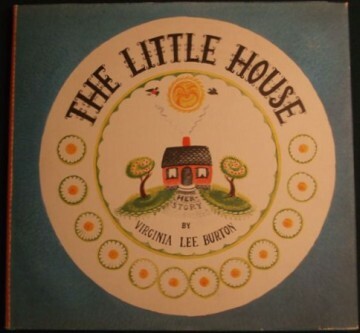 The Children’s Picturebook Price Guide estimates The Little House to be valued at $5,000 in Very Good condition. The first edition book being auctioned is in Fine condition, with a Fine dust jacket, so is likely to bring quite a bit more. 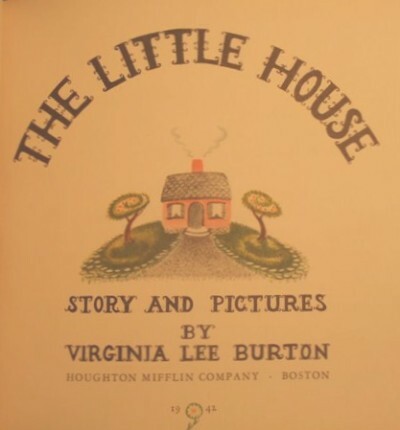 Written and illustrated by Virginia Lee Burton, published by Houghton Mifflin in 1942, The Little House first edition books do not surface for sale very often. There are currently none on the market. The July 12, 2007 PBA Galleries auction includes a rare first edition Curious George, along with a first edition The Gremlins, and a a first edition Pumpkin Moonshine. The Little House is the story of a house that is swallowed up by a growing city but is rescued in the end by being moved to the country. Like the machine-heroines in her other books, the house has human characteristics and feelings such as curiosity, loneliness, fear, and happiness–feelings with which children can identify. Upon receiving the [Caldecott Medal], Burton said, "In [my] creative collaboration with children I have learned several things. First, one must never ‘write down’ to children. They sense adult condescension in an instant, and they turn away from it. Moreover, their perception is clear and sharp … every detail, no matter how small or unimportant, must possess intrinsic interest and significance and must, at the same time, fit into the big design of the book." Accolades for The Little House came early and have continued over the years. Writing in the New York Times in 1942, reviewer Anne Eaton mentioned its "lively imagination and genuine power"; the 1943 Caldecott committee selected it as the "most distinguished book of the year"; librarian Anne Carroll Moore, known for her tough criticism, praised it as a "honest-to-goodness picture book"; and it has subsequently appeared on several "best of the century" lists. Pulitzer Prize–winning novelist Anne Tyler, in a 1986 essay in the New York Times , said that The Little House introduced her to "the realization of the losses that the passage of time can bring." As a child, she liked the book’s tone—"quiet but rhythmic"; as an adult, the illustrations "spelled out for me all the successive stages [of time]; the sun rises and sets across one entire page and a whole month of moons wheel across another." Prior to The Little House, Burton had written and illustrated Mike Mulligan and the Steam Shovel in 1939, another book that is now considered a children’s classic (and also very difficult to come by in a first edition book). She also won a Caldecott Honor award in 1948 for Song of Robin. In 1952, Maybelle, The Cable Car was published, based upon memories of her childhood in San Francisco, and helped to preserve the cable car in the city. In 1967 Burton donated the original artwork for Maybelle, The Cable Car to the San Francisco Public Library. Virginia Lee Burton died in 1968. 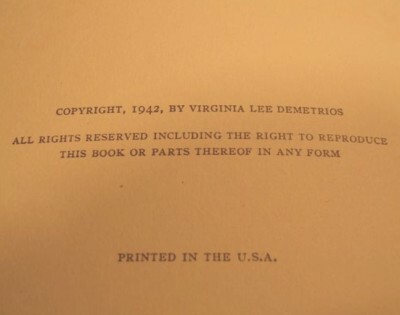 The key identifying point is the ‘1942’ on the title page, and no additional printings stated on the copyright page. it does not have the 1.75 price sticker like the one you have on your website but it does look very similar to the one shown above. I am not a book collector and was wonder if this book does have any value like the one above if there are any intersted buyers. it also has the caldecott medal page there is no plastic cover and there are no stickers on it I dont know how to find out if its the 1st edition but it does look like a very old book its in fine condition except for a marker line on the very back blank white pages if someone could tell me about this book and if it really does have any value that would be great thank you.